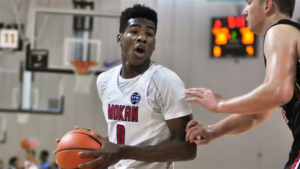 LAWRENCE, Kan. – Ochai Agbaji (Oh-cheye, ah-bah-gee) has signed a national letter of intent to play basketball at Kansas, KU head coach Bill Self announced Thursday. The Kansas City Star All-Metro Player of the Year, Agbaji, from Kansas City, Missouri, guided Oak Park High School to a 23-3 record in 2017-18 and its conference title. The 6-foot-5, 195-pound guard averaged 27.6 points and 8.6 rebounds per game his senior season. In addition to his Kansas City Star honor, Agbaji has been named one of five finalists for the DiRenna Award, the Greater Kansas City Basketball Coaches Association (GKCBCA) honor for the player of the year. The award, which began in 1954, will be announced April 12, one day prior to the GKCBCA All-Star Game, in which Agbaji will be participating for the Missouri Men’s Team. Self compared Agbaji to former Kansas standout and Kansas City native Travis Releford. Agbaji comes from an athletic family. His sister, Orie, is a junior on the Texas volleyball team which finished NCAA runner-up her freshman year in 2016 and won the Big 12 regular-season title this past season in 2017. His parents, Olofu and Erica, both played college basketball at Wisconsin-Milwaukee. Olofu lettered at UWM in 1991-92, while Erica was a four-year letter winner from 1991-94. Agbaji joins three other Kansas signees in Devon Dotson, Quentin Grimes, and David McCormack. The trio, who inked last fall with Kansas, were 2018 McDonald’s All-Americans and Grimes and McCormack will be on the 2018 USA Junior National Select Team at the Nike Hoop Summit, Friday, April 13 at 9 p.m. (Central) at the Moda Center in Portland, Oregon. Grimes also competed in the Jordan Brand Classic earlier this month.